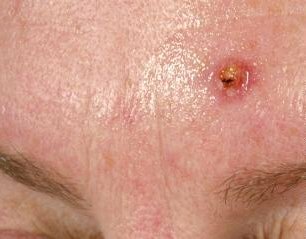 Squamous Cell Carinoma (SCC) is a type of skin cancer where there is an abnormal growth of skin cells in the squamous cell layer. It occurs in the fairer populations exposed to excessive sun especially unprotected areas such as face, neck, hands and arms. Squamous cell skin cancer is a more aggressive form of skin cancer, fast growing over a shorter period 1 to 3 months. It presents often as a raised red lump which does not resolve and progresses, later ulcerating and destroying surrounding tissue and can spread if not treated quickly and adequately. 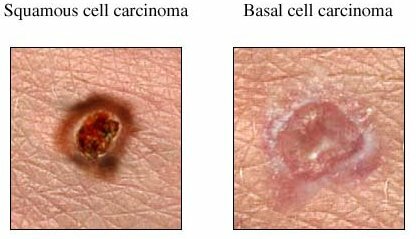 SQUAMOUS CELL CARCINOMA (SCC) represent 2 out of every 10 skin cancers removed. Treatment requires excision under local anaesthetic sometimes with sedation. The tissue removed is sent off to pathology to confirm the diagnosis and ensure the cancer is fully and adequately removed.